Everyone enjoys a good bagel. They sure do taste good. Bagels are a delicious food for any time of the day. They come in many varieties and flavors and taste great with a good number of toppings. Bagels were first introduced in 1693 as tribute to a Polish king. Since then they have crossed continents and become a mainstay in America. They’re sold in bakeries, grocery stores and coffee shops. Although bagels are good eats, the nutrition of bagels isn’t thought about unless you’re counting calories. 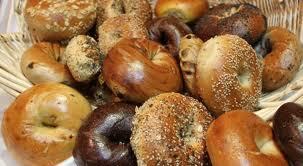 Bagels are a good source of vitamin C, calcium, iron, protein and fiber. Although they aren’t considered the healthiest of foods to eat, they do provide high amounts of fiber to keep you regular. Fiber lowers your chances of heart disease, diabetes and constipation. We are lucky to have so many bagel choices – Onion, plain, poppy seed, sesame seed, cinnamon raisin, sourdough, sun dried tomato, salt, everything, chocolate, egg, spinach, marble, blueberry, rye, pumpernickel, multigrain and many many more. We love bagels! Do I remember what everyone likes? What happens if I only get one of each type? Will people get what they want? Should I have mine now so I get the one I want? So many decisions just to purchase the bagels. And that was the easy part. Now, what about the cream cheese. Based on the number of bagels, how many cream cheeses should I get? What is the right ratio of cream cheese quantity to number of bagels? Are they heavy or light spreaders? Do they spread on both halves or only one and put them together? Will they toast their bagel? Does that matter? I wonder how that cream cheese will go with a multi-grain bagel? Look at all those choices – Geez, who is going to want what? How did such a simple pleasure turn into this dilemma? My doctor told me to watch the stress! So many choices, how can I possibly get this right. Please feel free to share your thoughts and process for matching bagels to cream cheese below.